If you’re on the search for a delicious Thanksgiving Pecan Pie, your search is over with this delicious holiday dessert! 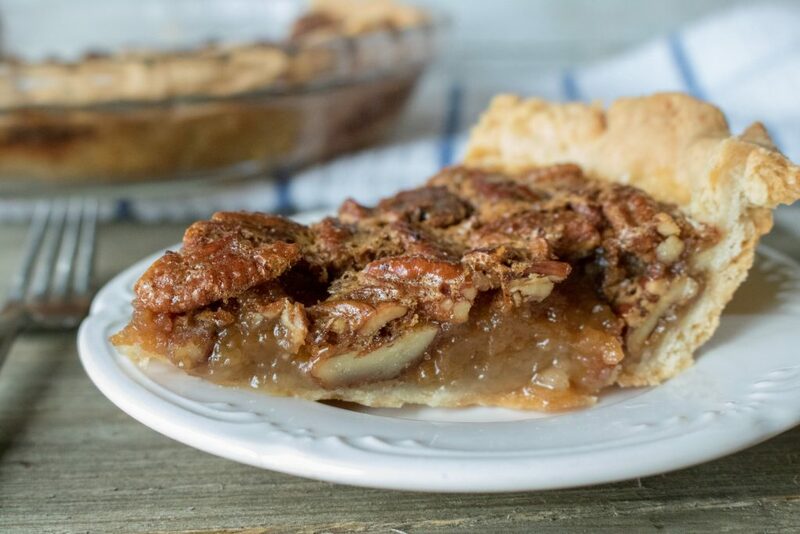 There’s nothing quite like a homemade pecan pie…the crunch of the pecans, the sweetness of the middle and the way that the crust perfectly flakes and melts in your mouth…Thanksgiving dessert is simply amazing. 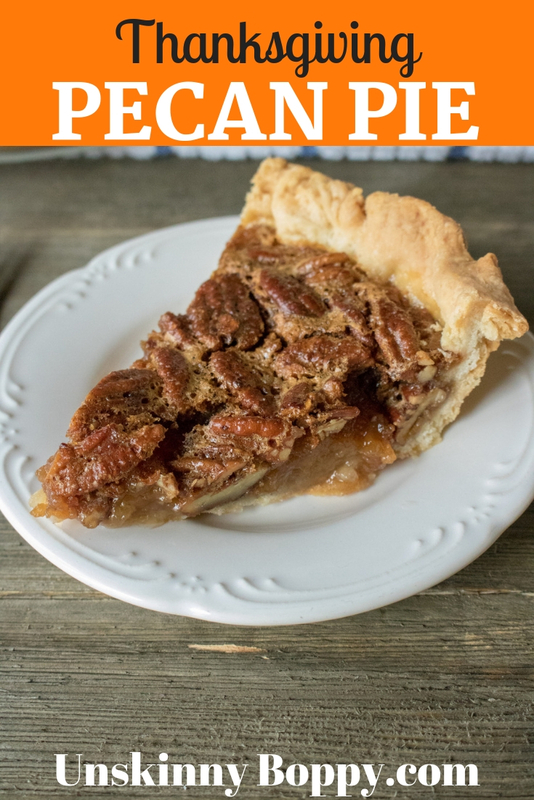 In our home, we love pies and this Pecan Pie is one of our favorites. There’s something about baking together in the kitchen that is also just such a great bonding moment for families. Tomorrow, when you are celebrating and being thankful for everything in your life, create another wonderful memory by creating this homemade Pecan Pie from scratch. 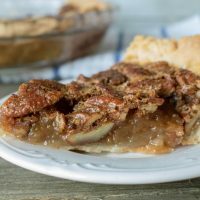 This crust recipe actually makes two crusts…so, if you wanted to plan ahead and make 2 pecan pies, you can with ease! After all, can one ever have TOO much pie at Thanksgiving? It’s just not possible! Enjoy this Thanksgiving dessert with your friend and family. It is truly a simple, delicious holiday dessert. To make the crust, pulse flour, sugar and salt in a food processor and pulse to mix together. Add in the butter, cut into small chunks, and pulse until the butter is no larger than pea size. Add water in a little at a time and pulse. Remove the dough from the food processor and knead together, forming two 4-5 inch disc shape with the dough. Pat dough out into two 4-5 inch circles. Wrap each piece of dough in plastic wrap and refrigerate for an hour or overnight. When you’re ready to make the pie, preheat oven to 350. Roll out one of the pie crusts. Line pie dish with one of the pie crusts. Mix the corn syrup, eggs, sugar, and vanilla. Add in the melted butter and pecans and stir. Pour pecan filling into crust in the pie dish. Bake at 350 for 70 minutes. Test the internal temperature of the pie. The pie has finished cooking when the temperature is 200 degrees Fahrenheit. Oh I have never tried a pecan pie, it sounds so yum! Can’t wait to try this recipe. Thank you for sharing!